Acclaimed author, speaker, and coach John Baldoni maintains that "leadership presence" is a form of communication, which therefore can be learned. But merely thinking good thoughts and voicing good intentions is never enough; ethical actions are the cornerstone of any leader's position. In this succinct, provocative, no-punches-pulled read, he demonstrates how managers can improve their presence strategically and tactically to develop the trust of their people so that they can accomplish their goals and the goals of the organization. 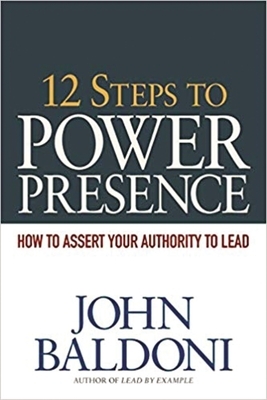 Baldoni't book 12 Steps to Power Presence does this by defining what genuine leadership presence is, including the five attributes of authority, and discussing right and wrong ways to demonstrate leadership based on real-life examples. Readers will learn: how to communicate objectives in ways that get people on board--even when it comes to tough subjects like layoffs, closures, and terminations; how to avoid the pitfalls of "analysis paralysis"; how to instill genuine pride in your team members for their own work and the company's; and how to share your insights with your team to coach them and create future leaders. Philosophers and management theorists have endlessly debated--and just as endlessly written about--the most important qualities of the world's top leaders. Ultimately, 12 Steps to Power Presence will guide you through the process of discovering, developing, and delivering on the most impactful leadership trait within your control: your presence.